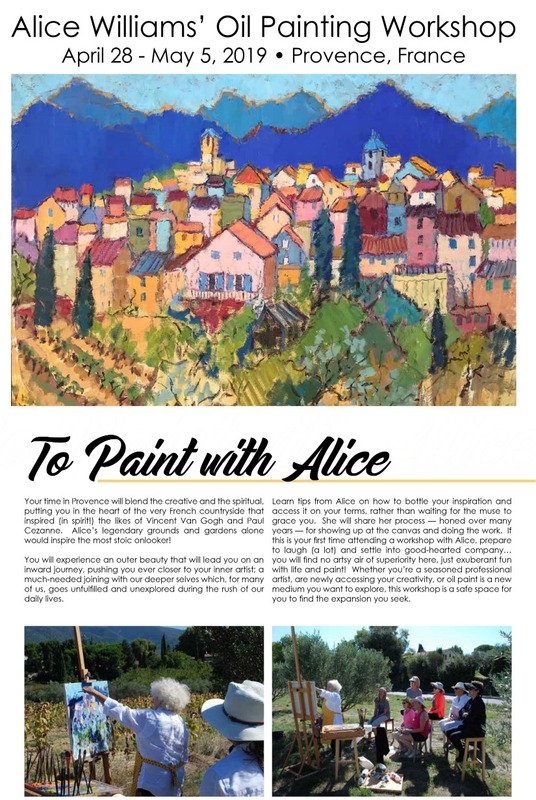 Hagan Fine Art artist, Alice Williams, will be hosting a painting workshop in her beautiful town of Provance, France. Your time in Provence will blend the creative and the piritual, putting you in the heart of the very French countryside that inspired (in spirit!) the likes of Vincent Van Gogh and Paul Cezanne. Alice's legendary ground and gardens along would inspire the most stoic onlooker! You will experience an outer beauty that will lead you on an inward journey, pushing you ever closer to your inner artist; a much-needed joining with our deeper selves which, for many of us, goes unfulfilled and unexplored during the rush of our daily lifes. Learn tips from Alice on how to bottle your inspiration and access it on your terms, rather than waiting for the muse to grace you. She will share her process - honed over many years - for showing up at the canvas and doing the work. If this is your first time attending a workshop with Alice, prepare to laugh (a lot) and settle into the good-hearted company... you will find no artsy air of superiority hear, just exuberant fun with life and paint! Weather you're a seasoned professional artist, are newly accessing your creativity, or oil paint is a new medium you want to explore, this workshop is a safe space for you to find the expansion you seek. Price includes private accommodations in one of three farmhouses with pools, within walking distance to Alice's farmhouse. Easels, stools, mineral spirits, a palette if needed. Though you are encouraged to bring your own.